In 2018 we continued to make enhancements to our complaint handling process. Through highly trained specialist complaints teams, we successfully closed 367,542 complaints by the end of the next working day, during the period 1st October 2017 to 30th September 2018. For the other 236,179 complaints received, these required further investigation and discussion with the customer before being able to close them. 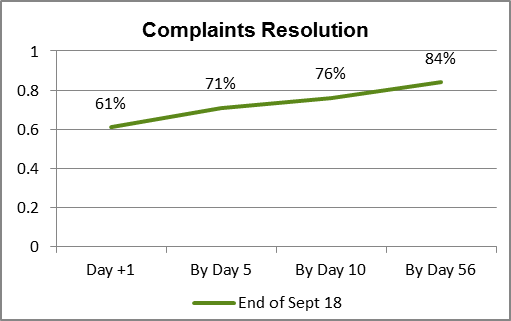 The vast majority of complaints are closed within the first 2 – 3 weeks, and by 8 weeks the number satisfactorily resolved is at 84% (see Complaints Resolution chart below showing our performance at end of September 2018). In line with these changes to our complaint handling process over the last twelve months, alongside other general customer service improvements, we also saw a significant reduction in the number of customers having to make a complaint. Taking into account the usual seasonal increase in complaints during the winter months (Q1 2018), the 12 months to September 2018 saw an overall reduction of 17% in our case volumes (see 'New Complaints Raised' chart below).